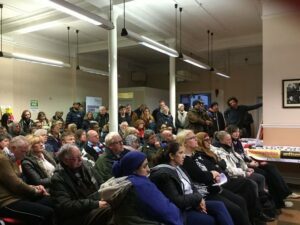 Nearly 200 packed into the meeting to commemorate Christopher and support the courage of his sister Janet’s fight for Justice. Christopher, a former British army paratrooper was killed by police in Hull 20 years ago. He died on the floor of the police station, handcuffed as officers made monkey noises and stood around laughing as he expired, with no attempt today to help him. Adding insult to injury, when the family thought Christopher had been buried after many years of delay, it turned out that the authorities had buried the wrong person. The police have also been accused of spying on the family for having the audacity to stand up to them and fight for justice. Fantastic support for the march and rally in Hull today came from York, Scarborough, Rotherham , Sheffield and Manchester as well as local Unions like Unite, the University branch of UCU and the loan of the room by City Unison and local organisations like Hull Afro Caribbean Association, Truth Juice and Stand up to Racism. 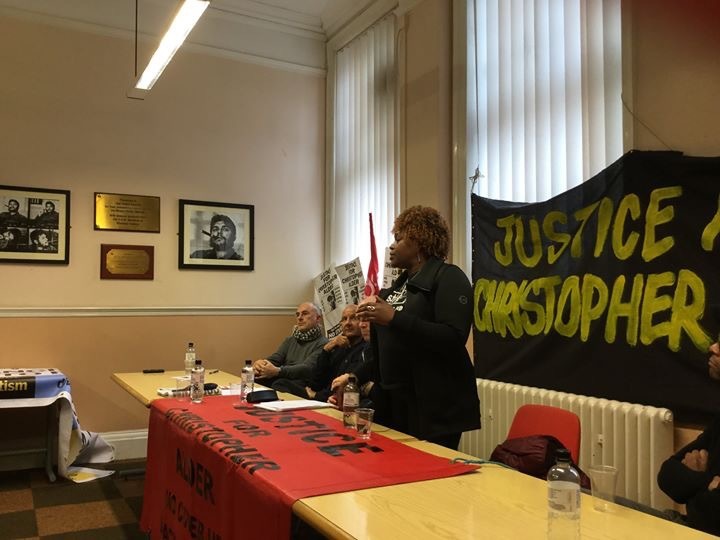 Today’s events were organised by the Justice for Christopher Alder Campaign and also included supporters from Lancashire No Justice No Peace.